For retailers of all sizes and scope, theft is a serious problem. In fact, a recent study commissioned by the Global Retail Theft Barometer found that shoplifting accounts for around $42 billion in losses for U.S. retailers annually, with employee theft accounting for 42% of all incidences. To protect their inventory and livelihoods, retailers must improve their situational awareness so that they can minimize liability, prevent losses, and control crowds. Learn why IP-based video surveillance systems are a crucial component of any retailers theft prevention strategy in today’s blog, below. Situational awareness is a key consideration for preventing theft. Maintaining a clear view of your facility is crucial for catching thieves in action and preventing losses. Situational awareness is not only key within your store, but also in highly trafficked areas such as parking lots and entrances and exits. 360 degree and omnidirectional video surveillance cameras offer the ideal solution for improving retail situational awareness. Thanks to their broad scope of view as well as high resolution and zoom capabilities, these cameras are a great improvement over PTZ cameras that were often limited in their ability to capture useful footage. IP-based video surveillance cameras bring the added benefit of simplified integration with other subsets of a facility’s security system. 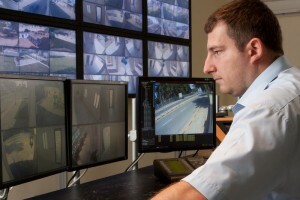 Access control and security control management software can interface directly with networked cameras to offer a holistic and streamlined approach to situational awareness. In addition to their benefits for preventing theft, IP-based video surveillance can capture data that can be useful for other areas of operation as well. For example, built-in analytics can give managers a better understanding of the traffic coming in and out of their stores, allowing them to better schedule employees and security staff. Video can also be analyzed to understand areas of the store that are most popular, offering useful data for marketing and merchandising teams to better optimize the shopping experience for your customers. This entry was posted on Thursday, May 5th, 2016 at 2:00 pm. Both comments and pings are currently closed.